Pauanui Glade Holiday Park is a family camp. Rules have been put in place to ensure the safety and enjoyment of all owners and visitors in the park grounds. Therefore, we kindly ask for your co-operation in following these camp rules. Behaviour that offends generally accepted standards of decency and order will not be tolerated. The management reserves the right to evict, without reason, refund or warning, any person(s) whose behaviour is considered offensive. All permanent site holders, casual campers and/or guests must register at the office on arrival. Arrival time: 2.00 pm. Accommodation or sites will be held until 4.00 pm on the day booked unless a full night's deposit has been received. Departure: 10.00 am. Balance of accounts are payable on arrival. Payment must be made for the full time booked. No reduction for early departure is given unless the accommodation or site can be re-let. The quiet down period is set between 11.00 pm and 12.00 (pm). Absolute quiet is expected between 12.00 (pm) and 7.00 (am). Reasonable behaviour and dress is required at all times. Consideration for other guests must be shown at all times. Children are to be supervised and controlled by parents or caregivers at all times. 5 km/h or walking pace is required within the camp. No driving vehicles between 11.00 pm and 7.00 am. The gates are locked at night. Check our notice board for the exact times. Please park one car only on your designated site ensuring right of ways kept clear. No visitors’ cars are allowed in the camp. A maximum of six people are permitted on each site. Please negotiate with the camp management if your family exceeds this regulation. The equipment in the children’s playground is for the use of people under 12 years old. No shoes allowed and a maximum of two children at a time on the trampoline. Caravans and campervans must display a current electrical WOF and comply with LPG Standard (NZS 5428:1998). Caravans and campervans must also have their own waste water container. Chemical toilets need to be emptied in the dump station. Power is for lighting, fridges and small cooking appliances. Washing machines and dryers are not allowed without negotiation with the management of a suitable fee. Tents connected to power must use an isolating transformer or RCD Safety Switch. 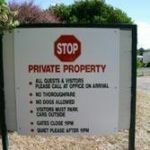 Visitors are allowed on site by courtesy of the management at all times. They must register at the office but are your responsibility and must depart by 10.00 pm. Dogs are not permitted in the camp. The cost of damage to property and accommodation will be recovered. For safety reasons, fires are strictly prohibited. Household rubbish must be wrapped and placed in the bins provided. Please recycle your bottles. 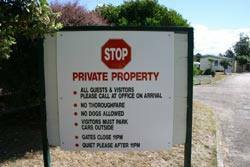 There is an alcohol ban in place at Pauanui Glade Holiday Park - alcohol can only be consumed on your site, not on any paths or in the amenities.